I've been hanging around New Orleans these past few days. It's not my first time in the Crescent City but it's been nearly 20 years since the last visit and might as well be first time all over again. I'm in the middle of my trip and still absorbing, not quite processing yet my feelings for her, but they're leaning deeply positive. Last night we went to Bacchanal in the Bywater, a wine shop-restaurant-music venue that feels more like a backyard party than a culinary establishment. It's the sort of do-it-the-way-we-want-to joint that seems to embody the anarchist spirit of New Orleans. I might be falling in love. Bacchanal has been around for about 15 years, in a building over 200 years old on a corner in the Bywater neighborhood, part of the 9th Ward that escaped flooding during Hurricane Katrina. The entrance opens into a retail shop where you select your wine and cheese plate, if you are so inclined, and a back door leads to the open air backyard dining room where you grab a table and order food at a modest window. A stage at the opposite side of the property hosts great live jazz music. The food is simple but stellar: mussels in a butter-white wine sauce, orchiette with broccoli rabe, Cannelini bean soup with Lacinato kale, and bacon wrapped dates stuffed with chorizo in a Piquillo pepper puree that imparts an enticing smokiness with a hint of spice. 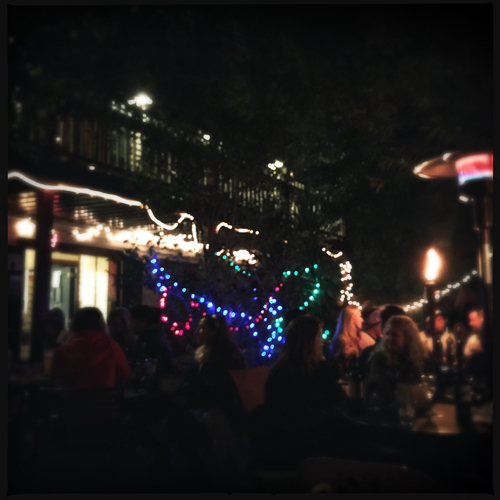 Everything is served on paper plates while the band plays up NOLA inspired jazz under strings of lights and gas heaters. The wine shop focuses on old world terroir driven cuvées. My favorite. I was looking for exactly that, and while there were many great bottles from loved importers like Louis/Dressner and De Maison Selections, I wanted something totally new to my palate. The guy helping me select a bottle recommended this Croatian wine. 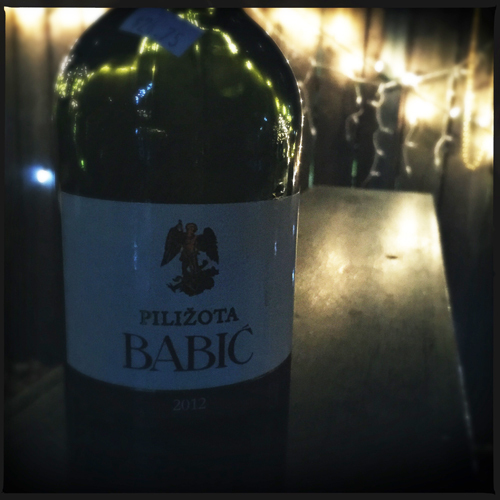 Babic is the grape here, a dark skinned, native variety capable of producing heavier quaffs with good acidity and some gaminess. Earthy with soft but firm tannins, it was a friendly drink with just enough personality to keep it interesting. It paired well with the assorted flavors on the table, making it especially good for sharing. This producer, Pilizota, practices sustainable farming methods on the outskirts of Sibenik, Croatia, one of the primary wine growing regions in the country. The wine is aged 12 months in large Slovenian oak casks, allowing the wine to evolve without extracting wood tannin or unnecessary spice. It's a wine true to its origin. I paid $25 for the bottle, but I'm fairly confident the mark-up is high considering the on-premise arrangement. I grabbed a bottle of Chiroubles Beaujolais on the way out and they take $5 off take-away purchases. On a return trip to the Bywater this afternoon, my travel partner and I were very, very tempted to go back to Bacchanal for another taste. We resisted, finding instead another great little restaurant called Oxalis maybe 12 or 15 blocks away. I had a perfect duck liver mousse (they called it pate, but it was smooth and rich) with house-made whole seed beer-mustard that I'd definitely go back for and a list of craft cocktails I'd love to try. But next trip, I just might set up camp at Bacchanal.